The management of industrial policy ideally takes the form of a cycle wherein industrial policy and its objectives are repeatedly adapted in order to improve the participation of the policy’s stakeholders or to account for new evidence. 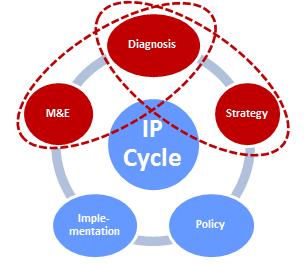 A typical policy cycle, as shown in the figure below, involves five distinct steps, the content of which is suggested by international best practices: (1) industrial diagnosis, (2) strategy design, (3) policy formulation, (4) policy implementation, and (5) monitoring and evaluation. The EQuIP Toolbox currently addresses primarily the first two steps of the policy cycle, i.e. industrial diagnosis and the design of industrial strategy. We are however in the process of expanding this. Diagnosis: By locating a country’s position within its industrial environment and analyzing the characteristics of its economy and society, the industrial diagnosis creates a baseline scenario with which different industrial strategies can be compared later on. So as to serve as benchmarks, several industrial development role models both abroad and at home are selected. The industrial diagnosis also identifies opportunities and threats to a country’s industrial policy based on the country’s strengths and weaknesses, the benchmarks set by its role models, and the evaluation of its earlier industrial policies. Strategy: Starting from the findings of the industrial diagnosis, the industrial strategy clearly states which objectives are to be achieved in what order by which means. In this assessment, the strategy has to take into account an objective’s attractiveness, whether strategies aimed at its realization are feasible, and whether a realistic timeframe will be met. Strategic objectives are defined in terms of measurable impacts in order to make it possible to evaluate whether or to which degree they have or have not been achieved. Policy: The industrial strategy’s objectives relate to certain intervention areas (e.g. the generation of productive employment), each of which is affected by different industrial policies. Thus, based on which objectives have been chosen before and depending on which intervention areas are targeted, various industrial policies are selected. Here, the limitations and constraints imposed on these industrial policies by the budget, the legal framework, the country’s institutional setup, and the extent to which those policies are perceived to be legitimate by their stakeholders have to be kept in mind. Taken together, this set of industrial policies forms the industrial policy mix. Implementation: In order to implement the industrial policies chosen in the previous step, an appropriate set of policy instruments needs to be selected and applied. The selection and successful implementation of these policy instruments critically depends on the characteristics of the policy environment. An efficient and effective implementation requires continuous supervision and possibly modification of the implementation process by organizations which do not suffer from conflicts of interest and have the necessary capacities for the task at hand. Monitoring and Evaluation (M&E): After the individual policy instruments have been implemented, the effects of industrial policy are monitored and evaluated in order to inform the next cycle of industrial policy. For this, a network of organizations which consistently collect, clean, and process data over long periods of time in order to develop accurate and reliable (industrial) statistics is needed. These statistics are then used to evaluate industrial policies, a task which should again be performed by independent organizations possessing sufficient capacities for that purpose. If some objectives have not been achieved, the evaluation has to find the cause of these shortcomings and suggest solutions. Finally, the results of the evaluation have to be communicated clearly to those decision-makers and stakeholders involved in the next cycle of industrial policy.